-Dust pollution mask made of 100% cotton, with replacement filter-activated carbon filter. -Free size stretch both men and women, ear clip can be adjusted freely. -With one way high efficiency breathing valve, keeps you smooth breathing,Easy to release heat and moisture,Prevent bacteria from breeding. -Invisable adjustable nose bridge keep the right height,Guard against fog,Suit for the men women with glasses. -Reasonable thickness also provides an extra layer of warmth and face protection in cold weather. -Protection against gases, smells, all PM; PM2.5, PM0.3, pollen, smoke and pathogens such as viruses and bacteria. -Good for cycling,hiking,skiing,crafts,gardening,haze day protection,bus,pets & pet Grooming,travel and other outdoor activities,and household,hospital,public places etc. -Suitable for all of us men, women, young, pregnant women, Teens, old people and weakened immune system. 99.4% average filtration of salt medium. 95.5% average filtration of oily medium. -Suggest changing mask filter for 2-3 days on average depending on the level of pollution it is used in.This mask can be used for a long time. As long as the filter is changed, its effect is almost equal to a brand new mask. -Remove the filter and then put the mask to neutral detergent diluted with water. Gentle knead, clean and dry it in the shadow. -Please do not soak in water for a long time and do not bleach, so as not to cause the mask distortion and reduce the defensive effect. -Depending on the usage, please adjust the washing time, general recommendation 1 to 2 weeks. Cotton fabrics and N99 filtering material.One military grade N99 mask and 5 filters,the masks and filters are individually sealed. Anti Pollution Design:Mouth mask with one way exhalation valve keeps you smooth breathing, Exhale,automatically open the valve,gas masks discharged smoothly.Inhale,the valve automatically closes to prevent the harmful gas into the mask.It helps to breathe smoothly, glasses do not fog up. Lab tested British military filtration technology filters almost 100% of pollution, gases, odors, dust, pollen, smog, PM2.5, germs, bacteria and viruses. 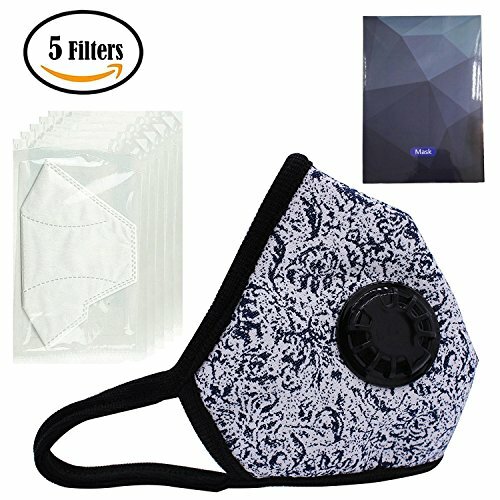 Masks are washable, and the filter can be replaced. Masks have a great filtering effect because they have 4 layers of filter. The first layer is skin friendly cotton, the second layer is silica gel layer, the third layer is pure cotton lining, the fourth layer is a filter with three layers of filter. Adjustable nose bridge: According to each person's nasal type to adjust, make mask and nose better fit, increase mask sealing effect, avoid breathing caused by the fog of glasses. If you have any questions about this product by Ohequbao, contact us by completing and submitting the form below. If you are looking for a specif part number, please include it with your message. MyAir Comfort Mask, Starter Kit in Mosaic Tile - Made in USA.